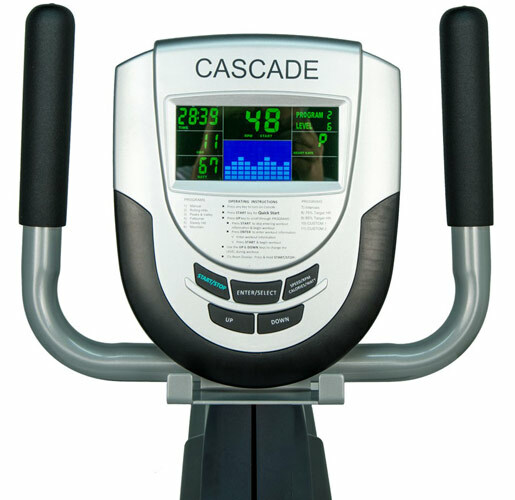 The Cascade Fitness CMXRT secret is a fixed gear design that gives you a more comfortable and realistic pedal stroke with 16 levels of smooth magnetic resistance. This lets you get a smooth pedal stroke as you exercise instead of the drag you feel in pedaling traditional recumbent exercise bikes. The end result? A more comfortable, efficient, and effective workout - with great features like an easy on and off walk through design, a breathable mesh seat back, a reclining seat for more comfort, contact and wireless heart rate and the CMXRT Smart Console which displays key workout statistics. With no friction parts to wear and tear, CMXRT recumbent exercise bikes are extremely quiet, durable and require very little maintenance. It's all about a smooth pedal stroke and the fixed gear drive provides the ultimate feel. Works for all different height users allowing easy change in seat position with a smooth one-hand adjustment. Simple interface providing the users with many options to tailor fit a workout program.